Chances are you aren’t living in your dream home just yet. But don’t worry — you’re in the majority. Usually, a home is missing that extra bedroom or perfect kitchen, bathroom or master suite. 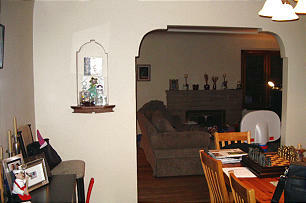 Maybe it is lacking the space for your growing family or a large area to gather your extended family. So, what do you do? Should you move into a new home or remodel the home you already have? The results of Greg and Nadia Letey’s remodel gave them the house they wanted. This is a dilemma most of our clients face. Remodeling isn’t cheap, particularly if you want to overhaul the entire home. The price of a full remodel is what pushed Janelle and Zach Smith into moving to a home near Trolley Square instead of remodeling. We tell our clients that you usually aren’t going to make money flipping a house right after a major remodel. Typically, it takes at least five years to gain the equity to break even on a full renovation project. 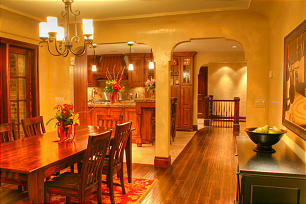 You only recover about 70 percent of the cost of the job in increased value immediately after a remodel. If you don’t plan to stay in the home very long, then it usually doesn’t make sense to invest a large amount of money into renovating it. We recommend homeowners faced with the moving or remodeling question consult a real estate agent. Real estate agents can help determine the value of your current home and the value cap for the area in which your home is located, show you what is available to buy in the marketplace, and estimate the cost of another home with your wish list of features. The “before” view is at right of Greg and Nadia Letey’s remodel. A real-estate value cap wasn’t as big of a concern for Greg and Nadia Letey, since they planned to live in their home for the rest of their lives. They loved the location — within walking distance of 1500 South and 1500 East — but knew their dream home wasn’t available in their neighborhood. “The neighborhood plays a big part in the happiness with your home,” says Greg Letey. For them and their son, it was all about the location. With family next door and more family down the block, they didn’t want to move too far away. The home itself has a family tie, as Nadia’s grandparents originally owned it. Deciding to remodel “was a family lifestyle decision,” Greg says. Cost is probably the No. 1 factor people use in determining whether to remodel or not. But remember there are “hidden” costs to moving as well as renovating. The expenses of moving include real-estate agent commissions, mortgage fees, closing costs, hiring movers and renting a moving van. Costs to consider beyond the basic construction budget for a remodeling project include architectural and structural engineering design fees, demolition costs, permit fees, possibly updating old wiring or plumbing, and the cost of additional furniture and window coverings for the new space. Besides considering the financial implications of your decision, compare the inconveniences of both options. Remodeling can be messy, noisy and force you to live without a certain part of your house during the process. Moving means the hassle of packing and unpacking, changing your mailing address and changing all your utilities. Finally, weigh the emotional costs. Are you willing to give up your current location, neighbors, schools and local congregation in order to move? Or would you rather deal with the inconvenience of remodeling? We help our clients weigh the costs and the benefits. Now the Leteys are living in a home they say is everything they hoped for and the Smiths moved one step closer to their dream home. Although , Janelle Smith says they are still shopping for the right house, she acknowledges that they will probably have to remodel in the end. “What we are finding is your dream house isn’t something you are going to walk in and find,” she said. “Every home has its own unique challenges but with a remodel the possibilities are wide open.” As always, we welcome your home architect design questions at ask@renovationdesigngroup.com.